Sometimes Mattel tries to align its build-a-figures to the figures that come in the series: for instance, Series 16 was full of Batman characters, and the BAF was Bane; Series 11 was GL-themed, and we got to build Kilowog. Since the series that was all about the Blackest Night characters came with Anti-Monitor, Nekron got pushed back. But since six of the seven figures in the series were involved in Brightest Day, it almost kind of makes sense. Nekron is not the actual embodiment of death in the DC universe - that's the perky goth chick from Sandman. He's the ruler of a dimension known as the Land of the Unliving, where the souls of everyone who had ever died waited until they went to their final destination. So basically, he's the afterlife's sinister maître d'. He may have delusions of granduer, of being the ultimate representation of death as an opponent (as opposed to "death as a release" or "death as an inevitability"), but at the end of the day Morpheus' big sister will come and take Nekron away just like she has everybody else. We've already talked about the choice of Nekron as the big baddie for Blackest Night and the way he was redesigned, so we won't repeat it here. He used to look stupid, now he doesn't. Suffice to say, he's a lot cooler and more threatening now than he ever was before, and that can only be a good thing. 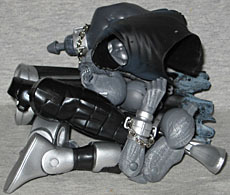 Nekron comes to us in nine pieces: torso/shirt, hips/skirt, arms, legs and head. Every figure in Series 20 gets a piece, rather than there being a figure that just comes with an oval display stand or something. The pieces all snap together tightly - perhaps too tightly in the case of the arms, which were tough to get into place thanks to the fact that you have to put them up under the sleeves of the robe to get them into their sockets. It's not impossible, and nothing broke, but we've come a long way since the days when limbs would pop out unless you glued them in. 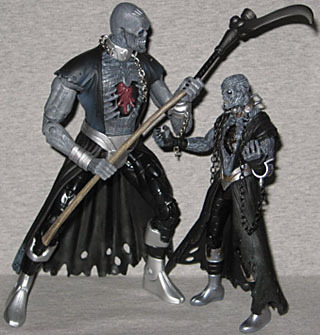 Fully built, Nekron stands just a bit shorter than 9¼" tall. His height was somewhat variable in the comics, so there's nothing really wrong with that. Honestly, we would have been fine with him being shorter, for reasons we'll get to later in the review. Weirdly, Nekron is highly articulated: rather than sticking with the same joints (almost) all the DCU Classics figures have had, he gets the benefit of double-hinged elbows and knees, and swivel/hinge wrists. Why on Earth is Mattel springing for new joints now, when they never would before? It's not like these pieces have any re-use potential. Maybe it's just a "thank you" to the fans for sticking around through 20 series? How do we know these pieces can't be reused in the future? It's the sculpt. The Four Horsemen have given Nekron plenty of unique, non-repeating details. The legs have etched-in lines running around them all the way up, and his exposed skin is dried out and corpsey. Can you think of any other character that could possibly describe? We can't. 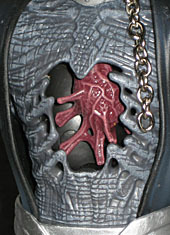 His chest is hollow, with his creepy heart floating there in the center. It's set deeper than DC Direct's version, and more of a separate piece. The chains hanging from his neck and wrists are real metal - since the style of the chains seemed to change every time Nekron was shown, there's no saying whether this particular arrangement is right or wrong. Similarly, the Black Lantern symbol stamped on his forehead stops right there, instead of stretching back over the dried out scalp and forming a sort of crown, like the DCD figure's did. Since he was portrayed both ways in the comics, it's just as correct as the other option, even if it doesn't look as cool. That's a matter of personal preference. 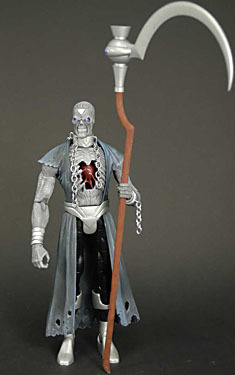 When Mattel sent out promotional images of Series 20, Nekron was shown with his scythe. It's kind of an important accessory to include, since it's basically the locus of his power: when his body was destroyed, another random zombie picked up the weapon and became Nekron's new embodiment. Whoever holds the scythe is Nekron, end of story. So when Mattel cut the accessory, they kind of crippled the character. If you have DC Direct's Nekron, you could give his staff to this one, but it looks small in his hands - and then that Nekron is empty-handed! Remember when we said we would have been happy if this toy were shorter? This is why. If the figure was smaller and he came with his weapon, it would have been better than what we've actually got; closer to the size fans think of when they think of him, and with the accessory he deserves. Bigger isn't always better. DC Universe Classics ran for 20 series despite having a terrible name and even worse distribution. It's been a fun ride, but there's just something appropriate about the fact that the lord of death is the figure to put the final nail in DCU Classics' coffin.